This summer, Tristan Eaton painted a mural of Audrey Hepburn for the L.I.S.A. (Little Italy Renaissance Fueled) Project. The artist is back with another piece in New York for the project, but this time the imagery is more of an homage to the city. 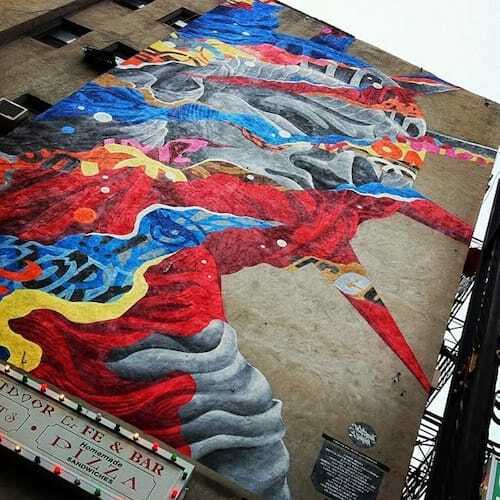 Eaton painted a massive Statue of Liberty portrait on Mulberry Street on the side of Cha Cha&apos;s Cafe and Bar. More than just a portrait, Eaton&apos;s piece is a collage in the shape of Lady Liberty&apos;s face with messages and patterns throughout, but not so much that her likeness is lost. For more about the L.I.S.A. Project, visit their website here.